The Static alludes to the net charge of an object, an interference, a random signal, a constant, but simultaneously a thing at rest. Yet, the charge, the objects, the associations, the visceral impact, like art itself, is alive … Electric. As in Mark Romanek's cult film of the same name, there can be a puzzling power in that interference, possibly something that reaches to something even higher. 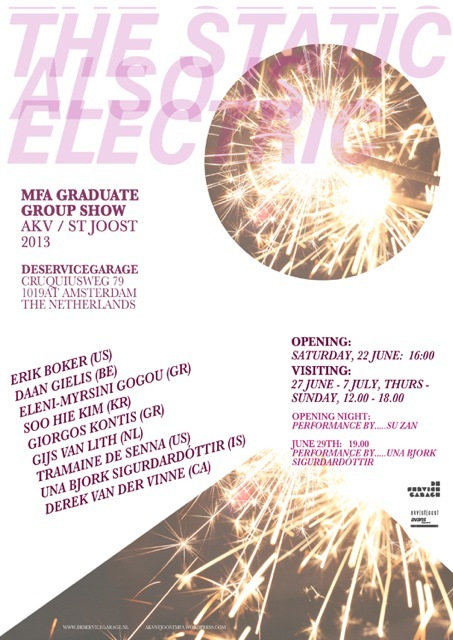 The graduation group show brings together the work of nine artists from The Netherlands, Greece, United States, Belgium, Canada, South Korea, and Iceland. Visitors will encounter recent works of sculpture, video, painting, installation, and performance, in conversation with one another, and shifting at the mark of the second week. Like perhaps a slightly bizarre evening gala, one might overhear topics approaching Post-Fordism, techno-Modernism, the nature of the Museum, Hitchcock, authenticity and Cy Twombly, and leopard-skin pants. If lucky, Bob Ross might even stop by.